A favorite Thanksgiving stories centers around Squanto's teaching new Pilgrim settlers how to plant corn with a fish for fertilizer in the bottom of the planting hole. The fish was probably herring, and the episode likely happened (like the story about popcorn at Thanksgiving, the tale is treasured, with or without scholarly corroboration). Whatever the historical support, the chemistry is spot on. Decaying fish provides a quickly accessible source of nitrogen, phosphorus and trace minerals for sweet corn plants, which are notoriously heavy consumers of soil nutrients. Use fish in modern forms to make your corn tall and tasty. Dig holes for planting corn hills (groups of three to five seeds in slightly mounded soil). Place a piece of dead fish at the bottom of each hill before planting seeds. Protect the hills from digging animals. (All About Stuff says in the Pilgrims' case, every dog in the community had a forepaw tied to its neck for 40 days to prevent digging up the fish, corn and all.) If marine-shore trash is easily available, include seaweed and any shellfish with dead fish for increased soil nutrition. 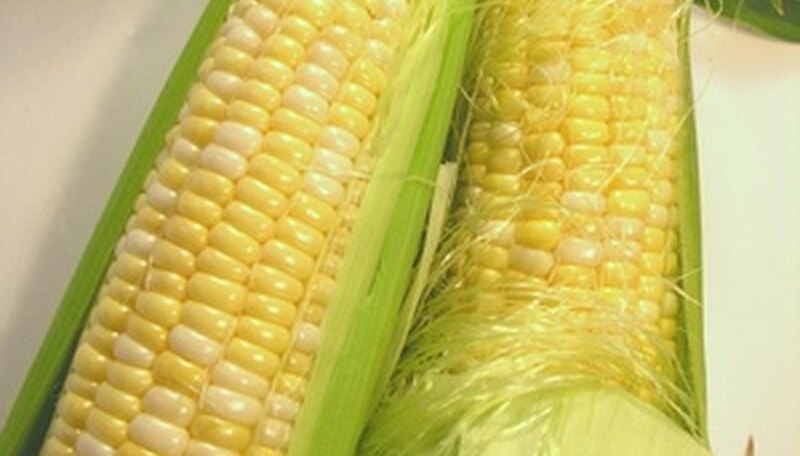 Follow directions for using liquid fish emulsion to fertilize sweet corn when planting and during cultivation. Industry efforts to reduce odor have made emulsion much more manageable for home gardeners. Both the emulsion and dried fish meal provide quick-release nitrogen to corn plants. If adding as a side-dressing to growing plants, follow precautions about light cultivation so you do not damage plant roots. Use dried fish meal in spite of manufacturers' observations that it still retains some fishy odor. Fifth Season's nitrogen-phosphorus-potassium tag (10-5-0) indicates it's suitable for corn. Fish meal is also a very economical way to enrich soil for corn. Mixing it with other meals can mitigate the odor. Dig it in or use it as a foliar spray. As with liquid fish emulsion, dark healthy leaves and heavy ears prove its effectiveness. Planting a single hill of corn with a fish for fertilizer makes a wonderful project to do with elementary-age children. For the sake of the family dog, make it a very small piece of fish, and add a small chicken-wire fence. For additional learning, turn your corn hill into a three sisters garden by planting beans to climb the corn stalks and squash to keep the roots cool. This planting strategy was shared from one Native American farming tribe to another and was used in many parts of the country.